Here we are, two weeks into the project, and still going strong. 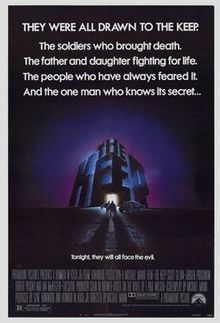 Tonight's movie is The Keep, directed by Michael Mann. Perhaps you didn't realize that Michael Mann had ever directed a horror movie, so let me help you visualize it - take all of Michael Mann's usual signature elements, and put them into a movie with a monster. Slow-mo scenes, shot in front of backlit smoke, while a synth-heavy score pounds in the background... Voila! I'm being a little unfair to Mr. Mann here. I actually liked this movie quite a bit, although I hear that he and the writer have both disowned it over the years. The movie is set in a small Romanian village, high in the Carpathian mountains. A division of Nazi soldiers arrives to guard a pass, and sets up their headquarters in a foreboding citadel that overlooks the village. The men are soon troubled by terrifying dreams. One night, two soldiers who are on watch decide to neglect their duty and search for treasure within the keep's walls. They accidentally uncover an enormous subterranean hold, releasing the evil force that the keep was built to contain. Mysterious events begin to happen within the walls, and soldiers are dying almost every night. Will they be able to discover the source of the evil? Will they be able to stop it before it escapes and spreads into the entire world? That's a very nutshell description, and I've left out some of the important characters and plot points, but you get the idea. As I mentioned above, the movie's makers are no longer willing to claim it, and it didn't meet with critical or commercial success, either. I don't know if I'm just feeling more generous this year or what, but I thought it wasn't bad. It's got a great cast (Jurgen Prochnow, Gabriel Byrne, and Ian McKellen), interesting set designs, and characters with some interesting depth to learn about. The effects are about as good as you'd hope for in a movie filmed in 1983, but when the evil force is revealed, it's got a great look. I give The Keep three golems out of five.